But MK is not alone. This is what happens when councils hand over public highways to private developers. What you think is a right – to take a photo, gather with friends, or simply walk along the street – turns into a gift; a gift that can suddenly be taken back in the name of ‘growth’. Artist’s impression of Intu’s ‘New Dawn’. Last year Intu triggered huge conflict over its plans to build new shops over much of the open space inside Midsummer Place, even as development sites lie empty nearby. Intu trills ‘It’s a New Dawn’. Xplain says “It’s a naked attempt at a land-grab”. 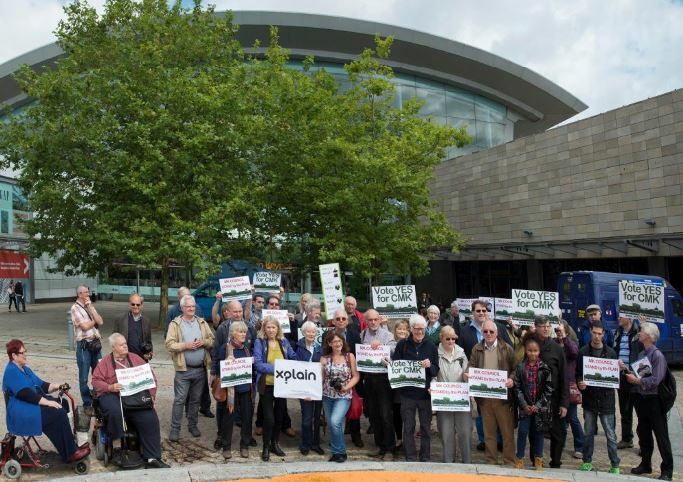 Public protest outside Intu – a thing of the past? Now, Intu has gone one further and applied to ‘Stop Up’ much of the internal space and parts of the public highway. If approved, Intu will not only be able to stop members of the public using the concourse but the space outside it too! No more public highway on which to linger or – heaven forbid – protest. We can also kiss goodbye to any prospect of running a new public transit link, between the train station and the rest of town, as the preserved transport route would be cut off. Normally, the public would have time to consider all this if the planning application were to be ultimately approved, following September’s public inquiry. But Intu are in a hurry, and by filing the Stopping Up order now, the public has to gather its thoughts straight away. So, if you object to handing over more public open space to Intu, and the rights and opportunities that go with it, please send your views to the Department of Transport by midnight, Weds June 15th. The applicant will probably email you and try to encourage you to withdraw your objections. But you do not have to reply or go into details; like the Guardian reporter – you can simply stand your ground. The proposed stopping up of the public highway and public rights of way will have a negative impact on public transport, pedestrian access and safety in one of the busiest parts of Central Milton Keynes. CMK is a fast-growing town centre. As thousands more residents, workers and visitors arrive to use the area in question over the next decade it does not make sense to reduce the space available for transport and access. A public transport route has been reserved inside Midsummer Place, but the proposed Stopping Up Order would privatise the land between the reserved route and the remaining public highway, meaning the public transport route would be cut off, in a dead-end. I too have been stopped by INTU guards in Midsummer place and in City Square outside Marks & Spencers. They said the area was private land and therefore I and fellow volunteers had move. Our crime? – Handing out leaflets for the EU referendum. Just how much iof the outside space near the shopping centre is private land? Does City Square really ” belong to the shoping centre” as the guard said? What about the open to sky strip between the old shoppign centre and the newer Midsummer court ( as was)? I thought that strip was a public right of way. Alarmingly Hermes pension fund (which owns the centre:mk, Food Centre, John Lewis car park etc etc has been quietly buying up parts of CMK for years and our short-sighted Council has also sold off or handed over parts of the public highway. I will double check, but think this includes City Square! Yes, the miserable alley at Midsummer Place is a public right of way but Intu’s intentions are clear: they want to stymie the building of any new public transit link and grab even more public space for short-term, prviate gain. How does it reduce movement? They are keeping the 24 hour walkway open and retaining a sufficiently wide reservation for the transit route that will cost so much to deliver through the centre it will never happen. Why retain a wider than necessary reservation when it has such a impact on the centre? CMK must move on. We are losing out more and more to it of town development and the city is looking very tired. Footfall is dropping we must attract the best retailers if we are to stay a regional centre. Oh and the applicant is required by the department of transport to contact all objectors to try and remove objections. That is considered good practice. So what the Daily Telegraph saw as “feudal” in the 1880s is now supposed to be “moving on”? Not in my book! Interestingly the Daily Telegraph reference is from an article entitled ‘How the West End was Won: the struggle to remove street barriers in Victorian London’. The article ‘shows how change accelerated with the installation of the London County Council. Acts of Parliament in 1890 and 1893 sealed the fate of many street obstructions and significantly changed the balance of public and private space in London’. It would be hard to argue that that story didn’t end well for the retail industry. For some reason, people like James seem to think the argument is between those who want CMK to thrive and those who don’t. No, we all want CMK to thrive, but those of us without vested interests have a more objective view of how to achieve it, for the benefit of the many, not the few. Complete tosh. Intu are applying to stop up only the highway and walkway needed to construct their development. They are using the perfectly correct legislation which allows a planning application and stopping up application to be considered together. Get your facts straight before writing your inflammatory and inaccurate articles. We stand by the accuracy of all the information in the article. 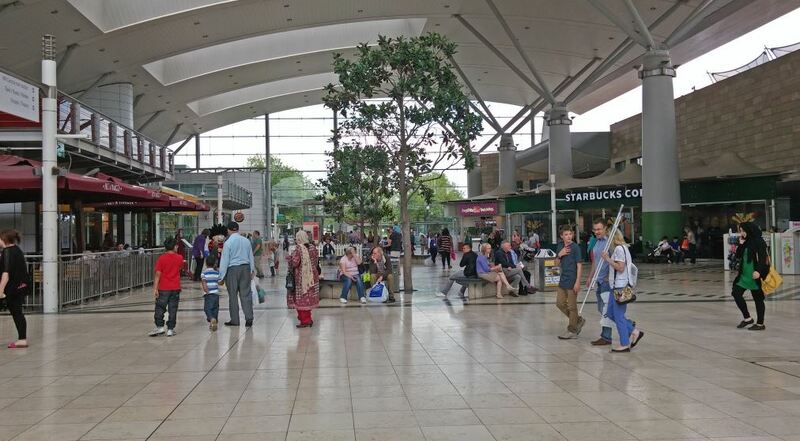 What many people consider inflammatory is Intu’s insistence on pushing ahead with a narrow-minded planning application which will reduce movement and future options, damage our unique heritage and undermine the entire strategic growth plan for the whole of CMK.